There is a hierarchy between God and humankind–just like there’s a chain of command in any organization. 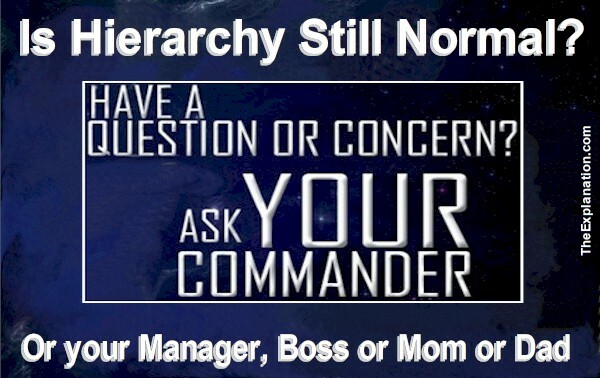 Is hierarchy still a normal part of our day-to-day lives? Do we ask our commander, boss, manager, mom or dad when there’s a necessity? We’re not finished with the last scene regarding God’s relationship with humanity. There are other basic points to glean so as to gather more comprehension. This is the opening scene between God and humans, and we’re hanging on each word so we don’t miss the slightest implication, the smallest clue that can help us unlock where the narrative is going and its ultimate climax. Click here: To follow along with the online Bible - If this is you first contact with this blog. Let’s come down to earth and put government and leadership, any governing body of any organization in the driver’s seat, and apply these same seven principles. This organization which oversees, whatever form it might take—top-down, collegiate, bottom-up—is necessary to establish the orderly conditions that bring peace. Peace is not the cause of ‘organization’ and ‘order’, peace does not precede union and stability; it’s the other way round. Organization and order are mainstay reasons for peace. Orderliness leads to harmony. There is no anarchy, disorder or turmoil in the Garden of Eden, for example. This hierarchy is set… humankind can do and say whatever they like… but in the script of the Bible play, God is in charge. I know, in our liberal democratic society there’s room for discussion, debate, and compromise and the concept and even the word ‘hierarchy’ sound very overbearing and incongruous. Talking about ‘someone in charge, with the idea of wielding a big stick’ is unacceptable to our minds–especially in light of some of the outrageous acts perpetrated by ‘powerful professional people’ in 2017. We shall return to this concept of hierarchy and leadership positions with much more explanation because such abuse of power is intolerable. This Bible text is not referring to this brutish authority and control. For now, just read it as part of the Bible story. After all, there are plenty of fiction books and non-fiction real-life examples of legends and tales built around powerful, overbearing, authoritarian leaders. If humanity follows these rules, there can be short and long-term benefits, if humankind breaks them there can be short and long term consequences. Making the rules includes the notion that they are inevitable and unavoidable whether man and woman know them or not. We might not like the term ‘rules’ but even in table games like Monopoly or Risk or in any and all sports be it football or table-tennis, rules are present. We might use other terms to describe them like decrees, guidelines, laws, orders, precedents or regulations. The end result is that they establish a behavior which is considered the norm for us to abide by. And the consequences of following or not following those rules occur relentlessly whether man and woman, you and I, are aware of them or not. Galacti pretends to be hungry, picks a mushroom in the garden and eats it, then shortly thereafter mimics sickness and pain. Even he isn’t sure if the mushroom species is poisonous, but by eating it, he accepts the consequences. He refrains from a ‘stage death’ to make his point: He may have eased his hunger in the short term, but he could have died. There are even rules governing what we can and can’t eat. Establishing the consequences of following or disobeying those rules: In this scene (Gen 2. 15-17) they are summed up or generalized by short and long term Life and Death. Hierarchy, Rules, Responsibilities, Consequences, Life, Death. We haven’t looked at any details or defined parameters of what they specifically are. Right now, I’m keeping you a little in suspense. I would like you to focus on the overview. There is much more to say, and we are getting there. But, first, as usual, let’s get the big picture. The first few chapters of Genesis do just that, they give us the backdrop and staging for the interaction between the characters of our play. 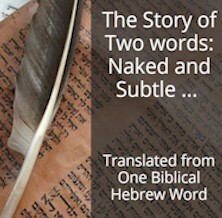 We’ve seen the beginning of that interplay between God and humanity represented by Adam and Eve. The next important thing to remember is that these four concepts—Organization, Rules, Responsibilities, and Consequences of God and humans—are part of the central point of the Bible. Each of these four points has the why, how, when, where, who to be looked into and it isn’t what you’ve heard before. I shall expand them and go into details. For now, we’re still setting the stage. Here comes the villain.